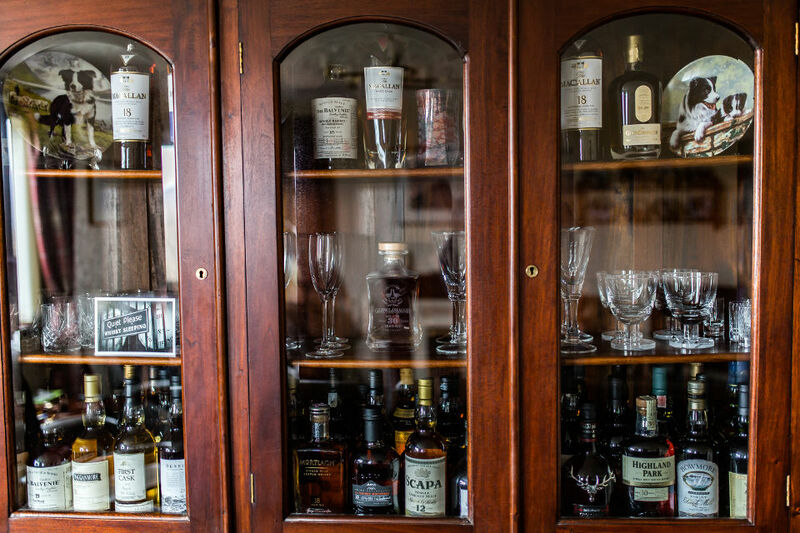 Ron is a whisky connoisseur with an extensive collection of single malt scotch. He also reviews malt whisky for a local newspaper and has been invited to speak about whisky at Burns’ Suppers. Feel free to browse his collection and let him talk you through the various whisky producing regions of Scotland. There are 2 two distilleries on the Isle of Skye. The first and most prestigious is the Talisker distillery on the shores of Loch Harport. It produces 2,700,000 litres of spirit per year which goes into blending (Johnnie Walker blends) and single malt production. The single malt is very peaty with a smoky and maritime flavour. It is much liked by malt whisky aficionados. The distillery has an excellent and newly refurbished visitor centre which attracts around 65,000 visitors per year. The second distillery is Torabhaig which started production in early 2017. It is much smaller than Talisker and is based on the old-style farm distillery. It is configured to produce a traditional island-style of malt whisky – medium weighted and peated. All of its production is intended to be bottled as a single malt. The distillery is located in the Sleat peninsular just off the A851 Broadford to Armadale road.